On 8 January, we hosted a webinar about the needs and challenges of electronic prescribing and medicine administration (ePMA) in mental health trusts in the UK. The topic was presented by Christine Wadsworth, a clinical pharmacist with more than 25 years of experience in clinical practice and ePMA implementation. She is currently ePMA Implementation Lead at the healthcare software company Advanced – one of Marand’s partners for OPENeP (Marand’s ePMA system) implementation in the UK. Christine’s short presentation was followed by a discussion with our OPENeP Business Developer and Communications Manager Tjaša Zajc, and a Q&A with the online audience. You can find the questions from the Q&A session at the bottom of this post, supplemented with answers from Christine and OPENeP Product Manager Roko Malkoč. What is specific in mental health trusts? Before software implementation, it is key for the institution to assemble a group of representatives of all the care settings, because they may have different requirements from an ePMA system in order to perform their role. In the mental health setting, care is delivered in a hospital, in a community clinic or at a patient’s home. How to capture the patient’s entire medications history to make it visible as a continuous record. When a patient is on leave, not discharged yet, medications might be given to them from the ward trolley or re-dispensed by the community teams. This needs to be recorded somehow. Also, electronic prescribing isn’t often used in the community setting, and there may be transcribing issues when moving from an ePMA system to a paper drug chart (the chances of errors are possibly lower from ePMA transcribed to paper but still may exist). FP10 prescriptions are sometimes handwritten; therefore it is challenging to gather the full record of prescriptions for a patient. Antipsychotic and dementia drug prescriptions can sometimes be given to the patient by other care providers (specialist centres or hospitals), and may not be visible in the patient’s GP record. T2 and T3 forms: Because in compliance with the Mental Health Act, patients need to consent to treatment which is documented on a T2 form, an ePMA system needs to record that as well. The system also needs to support T3 second opinion forms in the inpatient setting, as well as a Section 62 form. Register for a free webinar ”Free webinar: Mental health trusts: what should electronic medication management systems support?” recording with Christine Wadsworth a clinical pharmacist with more than 25 years of experience in clinical practice and ePMA implementation and Tjaša Zajc, OPENeP Business Developer and Communications Manager. Identification of super users who will know the system well and will be available for support to other users after the roll-out. While the inclusion and close collaboration with the ePMA vendor is essential, IT implementers might not always be allowed onto the wards. In practice, the implementation takes at least seven to nine months. Before going live, the provider needs to know which ward will be the pilot site, prepare a GAP analysis of the current processes, and consider how to achieve the best possible adoption. Going from paper to a computer system can be especially difficult for infrequent computer users, making training plans and learning resources preparation a vital part of the implementation. Does the system support titration? Does the system include alerts for antipsychotic dosing? Are multi-route prescriptions allowed with maximum doses for each route? How is access to medication history managed? You want a full picture of the continuous medication therapy. How are leave prescriptions managed? How can you identify which drugs are used for mental health purposes? Can visiting doctors use the system? How are their prescriptions managed? How flexible is the system for medication administrations? In the end, with a successful implementation of an ePMA system, the users are often surprised by various benefits an ePMA system provides – a constant availability of medication information, a clear audit trail and reports of processes, which can contribute to care optimisation. - How easy is ePMA to deploy in primary care? Do you have any experience with transmural implementations? In the Netherlands, the Dutch government is pushing towards transmural implementations of critical healthcare processes. Christine Wadsworth: It is more difficult to deploy ePMA into primary care (community) settings than in the inpatient setting. This is due to the number of health care professionals involved, their lack of access to computer systems with all the information they need, and the use of mobile devices which may not have the ability to provide all the information required. I have experience of the use of ePMA in the ePMA Community setting where patients had transferred from secondary care (i.e. transmural), which had been done successfully but was still problematic even after the go-live due to the limitations of the ePMA system used. With the right ePMA system and the correct access and planning, the transmural implementation would be less problematic. - Does the OPENeP system generate FP10HP prescriptions? Does it require the prescriber to add an indication? - Are there any specifics when it comes to children and drugs administration for them? If a legal custodian is assigned to the patient, how would that be managed in real-life situations? Roko M.: OPENeP was developed at the University Children's Hospital Ljubljana, in collaboration with doctors, pharmacists, and nurses. The system enabled dose calculation based on the patient weight and body surface, the use of unlicensed drugs, doses and routes, which are highlighted within the system. There is decision support for age, and also witnessing of administrations within locations, as well as for specific routes and controlled drugs. If the legal custodian is administering drugs instead of the nurse, the system will allow this with the ‘patient declared administration’ setting which can be automatically charted. If the policy requires nurse confirmation for the administration, the ‘nurse charted’ setting can be used. Each administration has a comment box for the nurse to document any relevant information. - Are all the requirements and questions concerning the requirements mentioned (one example: how does the system handle administrations/doses when a patient is on leave), are these written down somewhere and possible to get hold of? 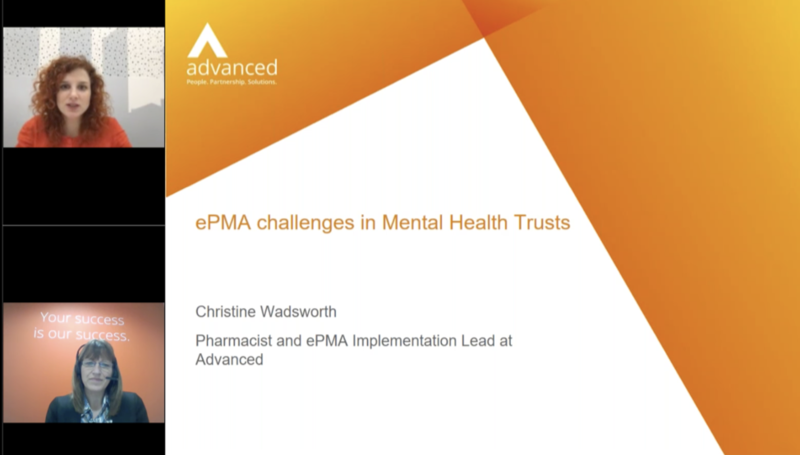 Christine W.: Ann Slee from NHS England can assist with the requirements to assist Mental Health Trusts with their selection of an ePMA system. - How important is the graphic design of the system? Christine W.: It is very important that the system shows usability, and the design is a large part of this. If the screens are too full of content, the user will be bombarded with information and might miss a key piece of information. Prescriptions should be clear with clear dose and frequency displays, and the electronic drug chart should be simplistic so that errors cannot be made when selecting doses. Seven things to think about before buying an ePMA. To go beyond this summary, watch the recording of the webinar.